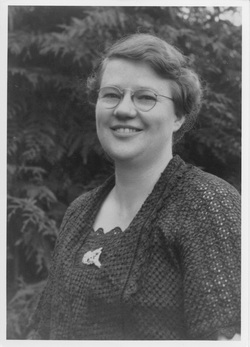 Photo of Helen McCall taken in 1939. Helen McCall's photographs document the rural life of British Columbia's Sunshine Coast during the twenties, thirties and forties. Helen's involvement with the people and the life of the Sunshine Coast, coupled with her determination to become financially independent, led to her career in photography. Helen Barnard was raised on a small family ranch on West Howe Sound, about twenty miles north of Vancouver. She worked hard as a young girl. On steamer days, when a vessel from Vancouver 'hove to' off shore, she would meet it in a rowboat, pass aboard farm produce and head for home with a cargo of groceries, feed and grain. Normally these types of jobs were reserved for the boys of the family but because Helen had no brothers, it was necessary for her to assume some of the more physically strenuous outside jobs. Living in isolation with friends and other families miles away, Helen thought nothing of hiking long hours through the forests and mountain terrain. She developed the endurance for walking and climbing that later allowed her to select unusual shooting angles for her photographs. Helen married Hector McCall after his return from World War I. With Hector partially disabled from war wounds and unable to return to logging, it was necessary for Helen to consider a career to supplement the family income. Living in a rural, scattered settlement where there was no paid employment for women, Helen was forced to choose self- employment. She knew the people around Gibsons Landing. Their way of life was her way of life, and she had to produce a product they would buy. She began photographing them and everything they did. In 1916 she went to Vancouver to learn photography at Silver Finish Photography. Her first results were not all good. Many problems challenged her but she was not discouraged. Eventually Helen learned to control the mechanics of photography. It didn't take long before she was comfortable choosing her aperture and time settings for any given lighting situation. She was also faced with the difficulty of learning how to develop her negatives and prints in a darkroom without electricity or running water, but that, too, she eventually mastered. Now that Helen had something she could sell, she had to decide how she was going to sell it and who was going to buy it. She had no ready-made market to step into, nor did she have any experience in marketing and sales. Not only did Helen have to learn an entirely new trade, she had to fight to create a demand for her product. She chose the postcard as a sales medium for her photography and considered every vacationer and resident as a possible customer. What she photographed had to mean something to every one of those individuals. Her potential market in the West Howe Sound to Pender Harbour area in 1920 depended on a base population of about one thousand and that number doubled during the summer months when tourists from Vancouver came to enjoy the rural life. Helen's business success depended totally on her ability to work within the confines of this extremely limited market. She tackled the challenge of professional photography energetically and artistically. She photographed sports meets, picnics, regattas and other outdoor functions. Indoors, with the aid of the photo flash, she took shots of dramatic performances, anniversary dances, concerts, and so on. As a member of the Howe Sound Women's Institute, she helped raise money for a community hall and photographed every significant function held in it for several years. She attended weddings, photographed school classes every year, called at the homes of senior citizens and took their pictures in their gardens or living rooms. No event went unnoticed. Helen photographed everything and everybody. And people bought her cards. She made events in their lives important. Activities were recorded and the people in the communities along the Sunshine Coast were constantly reminded of their participation and contributions. Most of the group and personal photos were taken from September to June and were aimed at the local market. For the summer campers, Helen decided that she must take scenic shots. She realized that trite reproductions of most landscapes would not suffice for this purpose. In her search for views that would be both artistic and representative, she walked roads and trails, climbed mountains, and made her way along rocky shores. She traveled by steamer or small open boat to reach communities and scenic sites along West Howe Sound and up the mainland coast beyond road ends. In each scene she framed the subject area by natural elements, beyond which lay a seascape or a mountain backdrop. She knew her scenes would travel with her customers. She wanted to represent the Sunshine Coast in a way no story ever could. When looking for a suitable scene she always kept in mind the human interest factor. She chose her views well. Helen would usually travel alone, carrying her heavy camera and tripod- equipment quite unlike modern collapsible lightweight gear. She preferred using slow time settings and small apertures to obtain maximum depth of field, especially where backgrounds were distant. Helen worked without benefit of the precision lenses- and high speed shutters of modern cameras. She was restricted to film that would be considered hopelessly slow today. The "Howe Sounders" playing at a dance at the WI Hall in 1935. Working without electricity, she spent endless hours making prints by exposing them to ever-changing natural light and drying them at room temperature. To bring out a touch of colour in her scenic views, she experimented with sepia in her fix solutions; even familiar views took on an enchanting air. The majority of her photographs were titled and signed, identifying Helen as artist and producer. Helen also did photographic processing for amateur photographers in the community. One long-time Gibsons resident recalls taking his mother's film to Helen to have it developed. If she was not home, the film was left in a cupboard outside the front door where the prints could be picked up several days later. She even trusted her customers to leave the correct amount of cash in the appropriate tin outside her front door. Further memories recall times when Helen would attend school career days and talk to students about the aesthetics and techniques of photography. Throughout the Great Depression, Helen was the sole supporter of her young son and daughter. She maintained racks of postcards in every available place of business from West Howe Sound to Pender Harbour. Despite general economic conditions, her work continued to gain in popularity and her sales expanded. No one seemed to know very much about Helen McCall, or to realize what she was contributing to their lives. Simply by photographing the people and their events, she gave them a sense of pride in their community and a feeling that their lives were in some small way very significant. Although Helen probably saw herself as a business woman rather than a photographic historian, she did indeed record our regional history. Her commitment and dedication has left a priceless legacy. Through her photographs we see a lifestyle and a community of many years ago. We also see a pioneer woman who made a successful career out of little more than financial need, self-determination, and common sense.